The former gate house at the Colonial Sugar Refining (CSR) Co Ltd, along Bowman Street leading into Refinery Square, in the inner west suburb of Pyrmont. 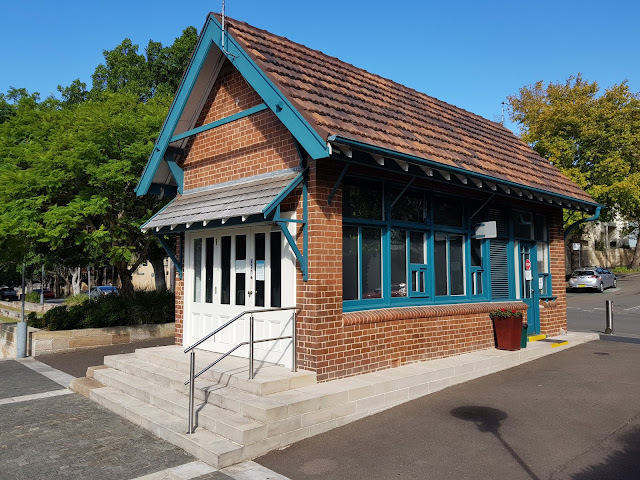 The heritage listed building was built in 1906 in the Federation Queen Anne architectural style. CSR Limited had a major sugar mill, sugar refinery and associated industries at this location. Over the years, the company diversified operations into rum distillery, building products and eventually mining. The site was redeveloped into a high rise residential estate with the gate house now used as a security office. Linked to: Our World Tuesday, Tuesday Treasures, Pictorial Tuesday, Travel Tuesday, All Seasons, Thursday Doors. As you'd expect of such a building, small- but it has character. Lovely little building - glad it's still used and appreciated. I love that this gorgeous piece of history is still in use. So glad they kept it! Interesting reuse of the building. It looks great! I love Edwardian architecture, but mostly we see it in family homes. Here is the gate house of a refinery that used the same bricks, paint colours and roofline! Cute and beautiful gate house, and has aged very well. I see two doors, so you have already a post for Thursday doors! Many thanks for sharing this treasure with All Seasons. "You're welcome" (referring to your thanks about changing the linky procedure:). Have a fun week! Thanks for the tip for Thursday Doors, Jeannette. How time change everything. Nice little building. Still a gate house of sorts. Looking good after a hundred years. Such a charming building. Those shades of green are my favorite for a structure. Thanks for sharing. I'm trying to work out where that is - in relation to the Casino or Pirama Park? Lydia, it's at the opposite end of Pirama Park to the Casino, closer to Anzac Bridge. I love this building -- it's shape, steep roof, and the touches of blue that make it noticeable and appealing. That is a lovely little place.